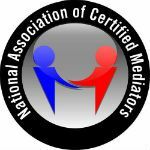 The National Association of Certified Mediators (NACM) began in 1999 as a group of Mediators sharing a common goal, to provide a category of Professional Mediators with the basic academic credentials necessary to provide the general population with excellent mediation services. We are dedicated not simply to a select few who seek certification but to the general population. All current certification processes are strictly academic and theoretical. We felt that many of the mediation certification processes promoted less than what we felt was required to provide mediation services. Our goal is to provide basic mediation knowledge and updated mediation philosophy to all qualified mediators. A general acceptance in the industry is that once certified by any certification organization the certificate holder is fully qualified to mediate. This is a misconception. A certificate provided by us or any of our associate organizations demonstrates a quantitative proficiency in a theoretical and academic arena only. The true qualifications of a mediator should be qualified by the employer. Only that individual can ascertain the other requirements of a mediator which cannot be measured in a written test. Our examinations are designed to provide the basic knowledge that we feel mediator should have. As with any certification, degree or diploma, the real learning process comes in working with an experienced mediator. The employer is responsible for hiring and is therefore in a position to determine if a person who has the academic credentials (certification) can also demonstrate the skills and ability to be on the staff. These cannot be measured in a written test. We also don't require CEU's for recertification. You pay the same fee to recertify. You'd pay more on the CEU plan, however we also don't feel that a single course every three years satisfies the educational growth requirements. The learning process should be self motivated and continuous. Educational sources are numerous, books, trade magazines, the internet, television and formal University courses or classes. We offer a certification and recertification prep manual immediately available for download when you pay. When you're done reading it drop over to the testing site again and take the certification test. If you fail, go over the area of study that you missed and take the test again.